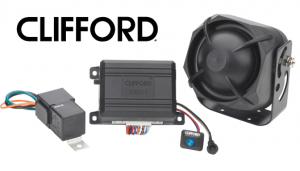 The Clifford Can-Bus Alarm works perfectly with the original vehicles remote control. Most Can-Bus alarms work with many vehicles made after 2005. Meaning Thatcham alarms can be fitted which work very well with the original locking on the vehicle. The Clifford Can-Bus alarm features a bright blue LED and the ability to add on dual zone proximity and OBD port immobilisation.